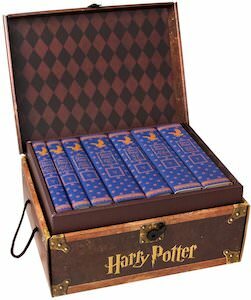 If you want a special Harry Potter book then you should check out this Harry Potter Trunk Set Books. There now is a cardboard Harry Potter trunk that looks like something he would take to Hogwarts and inside the trunk you will find all 7 Harry Potter books but these hardcover books have a special sleeve that is in the color of your favorite Harry Potter house so yes you can pick the house you like best and you can have a book set made in that color. Sure this may not be for everyone but if you are a true Harry Potter collector then you have to check this out.